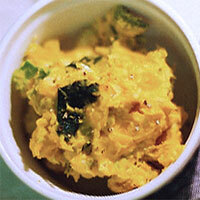 Pumpkin salad is a very tasty warm salad, that can be eaten as a meal in itself, particularly for breakfast or dinner. It is made by mashing cooked pumpkins, adding mayonnaise, balsamic vinegar, salt, pepper, a little bit of spinach and lettuce. Optionally, the salad may include olives, pumpkin seeds, yogurt, tomatoes, peppers, pickles, etc. This is all topped off with a fried egg, which has a solid white but a runny yolk. Although pumpkin salad is technically a salad, it is not the right type of salad to eat when on a diet. It is very nutritious, but it is also rich in fats. The calories in Pumpkin Salad per 191g(1 medium sized plate) is 395 calories. Pumpkin Salad is calculated to be 207Cal per 100 grams making 80Cal equivalent to 38.65g with 28.92g of mostly fat、22.46g of carbohydrates、10.14g of protein in 191g while being rich in vitamins and minerals such as Vitamin E Alpha Tocopherol and Vitamin K.